Nightgate Inn is an inn in a remote region of the Pale. It is located east of Shrouded Grove between Alftand and Irkngthand, and west of Windhelm. Hadring tends the counter, buying and selling food and drinks, and renting out rooms for 10 gold. It consists of two areas, Nightgate Inn and Nightgate Inn Cellar. A False Front: Find and deliver some forged documents to the Stormcloaks. Recipe for Disaster: Assume the identity of the famous Gourmet in an effort to assassinate the Emperor. 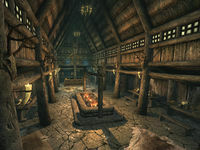 Like many other taverns, Nightgate Inn consists of a huge taproom with a fireplace in the center and the counter at the opposite end of the room from the entrance. Three wooden tables are scattered around the taproom, all of them set with food and drink. In addition to the taproom, the inn also has three smaller rooms with single beds, one of them reserved for paying customers, and a set of stairs leading down to the basement. To the left when you enter, is the first table which is dressed with two loaves of bread, two bottles of wine, and one bottle of alto wine. In the northeastern corner stands three food barrels. Next to the barrels are another table with two loaves of bread, and more wine and alto wine, two bottles of each. The next table is where you can usually find permanent resident Fultheim. The table in front of him is dressed with three loaves of bread, two bottles of alto wine, and one bottle of regular wine. Next up is a set of shelves with two elves ear and seven bottles of Nord mead. The bar takes up most of the northwestern part of the taproom and Hadring can be found behind the counter 24 hours a day. On display is a wedge, a slice, and a wheel of eidar cheese, and the same of goat cheese, excluding the wheel. A bottle of wine and a bottle of alto wine are also on display. Hidden on the shelves underneath the counter are five gold coins, a steel warhammer, three coin purses, fourteen bottles of Nord mead, six bottles of wine, two bottles of alto wine, and a copy of the book Killing - Before You're Killed. In the southern corner is a set of shelves with two bottles of alto wine and six of regular wine, along with four loaves of bread. Next to the shelves are two food barrels. Hanging from the ceiling, above the stairs leading down into the basement, are six dead rabbits and four pheasants. Hanging next to the game are a few ingredients, including two garlic braids, some dried elves ear, and some dried frost mirriam. 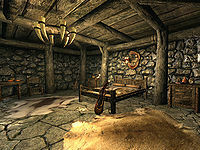 The room you can rent is the first room along the southern wall and contains a single bed, a wardrobe with random clothes, a chest with minor loot at the foot of the bed, and a copy of Walking the World, vol XI, along with a bottle of Black-Briar Mead. The neighboring room can be used by the courier in the Imperial version of A False Front. It contains a dresser with clothes, several common books, and a chest with some loot. Opposite these two rooms is another room, which is larger and has a double bed owned by Hadring. Several books are stacked on two dressers with clothes, that also have a steel dagger and three bottles of Nord mead on top. Hidden in the northern corner, behind three food sacks, is a coin purse. Along the eastern wall sits an empty chest and in the northwestern corner are two bottles of alto wine. Down the stairs from the taproom is the cellar where mysterious Orc resident Balagog gro-Nolob resides. It consists of a huge storage area and a smaller room for Balagog. The storage area has numerous inactive beer kegs and crates, along with six food barrels and six food sacks. In the northeastern corner is an exit to Skyrim. Balagog's room contains a double bed with a lute at the foot, a wardrobe with clothes, two end tables with clutter, and four food sacks. In the southwestern corner is a small table with a bottle of alto wine and two boiled creme treats on top. The end table to the northwest has a bottle of alto wine on top, with another bottle lying on the floor. The end table to the northeast has a coin purse on top, right next to a copy of the Sneak skill book Legend of Krately House. This is the merchandise found in Hadring's merchant chest. These items are only available if purchased from the merchant; they cannot be pickpocketed or stolen. They are restocked every two days. Two orichalcum ore veins are located 300 ft south of the inn. If Hearthfire is installed, three clay deposits can be found east of the inn on the bank of the pond. Unused merchant chests and keys suggest that the inn was meant to be part of a village known as Heljarchen, which previously appeared in Arena as Helarchen Creek. This village would have contained an apothecary, a blacksmith (whose merchant chest can still be found under the map nearby) and a few farmhouses. However, only Nightgate Inn made it into the final game, and the name was later reused for the constructable house in the Pale added by Hearthfire. This page was last modified on 9 February 2019, at 18:54.